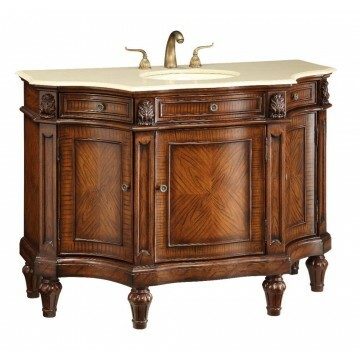 Home » Traditional » 40" - 49" » Canisius 47"
This unique Canisius sink vanity will take your decorating to a higher level, it is the signature of master craftsmanship. Full of intricate detail to perfections. Constructed of solid hard sturdy wood and pattern veneer door paneling The hand detailing quality finish brings out the luster of the wood. Give your bathroom an upscale of beauty and luxury appearance. Cream marble countertop. Bisque undermount porcelain basin. Two functional small side drawers. 8" spread faucet sold separately.